I first heard about this old-time cure-all remedy from The West Ladies a few years ago and it’s been on my to-do list ever since. You may also see it called “Fire Cider” or “Master Tonic”. I love trying natural remedies instead of traditional medicine when appropriate and this one really intrigues me because it’s made with just 6 common ingredients. It’s full of antiviral, antibacterial, and antifungal properties and is sure to give your immunity a good kick in the pants! Step 1: Roughly chop all ingredients. Step 2: Process in food processor with enough cider to cover until pieces are small and uniform in size. Step 3: Place in clean jar and add enough cider to cover all ingredients. Cover with clean lid. Step 4: Keep in cool dry place for 2 weeks, shaking periodically. Step 5: After two weeks strain liquid and store in refrigerator. Mix 1 tbsp with 8 oz water daily to keep illness at bay or take 1 tbsp straight. Take as needed when sick. May be added to soups, salads, beans, casseroles, etc. to boost flavor. Disclaimer: I am not a medical professional. Please do your own research before taking home remedies. This is not intended to replace a professional opinion. Also, if the tonic looks or smells off in any way you should discard it immediately. 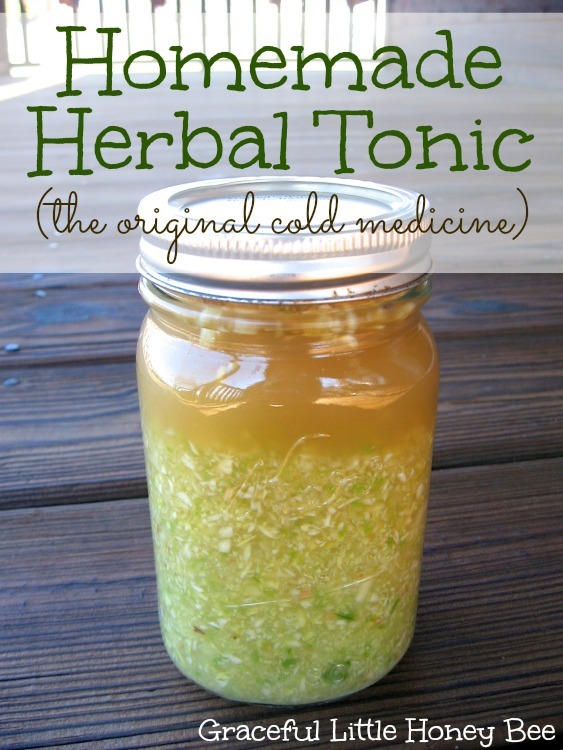 Have you ever heard of this tonic? Would you consider taking it for cold & flu prevention? I’d love to know! We have been using a version of this in our home this week while we've had the flu. A couple of my folks complained right at first, but then said they felt better so fast wanted to know when they could have more. :) Our version also had honey. That's awesome! I have been taking it straight without the honey and it is STRONG! Thank you so much for linking up to the From The Farm Blog Hop last week! I chose your post as my fave :) Thanks again! Can you use the veggies and the juice in should, or do you suggest using just the juice? Also, I'm assuming the acv makes this being unrefrigerated safe. Are there any temperature danger zones to be aware of? You may eat the veggies as well if you want. I keep mine in the refrigerator. This is a helpful one another great way to make it is to put everything in blender once it's been blended place on dehydrator and dehydrat once done blend to fine powder then you put in the gel caps you can pick up at health food store or order on line. Then you have no burning I know my teens like this much better. Lol and you can but in bottle and take with you easly .